A host of New Year's afterparties guarantees you won't get home 'til dawn. 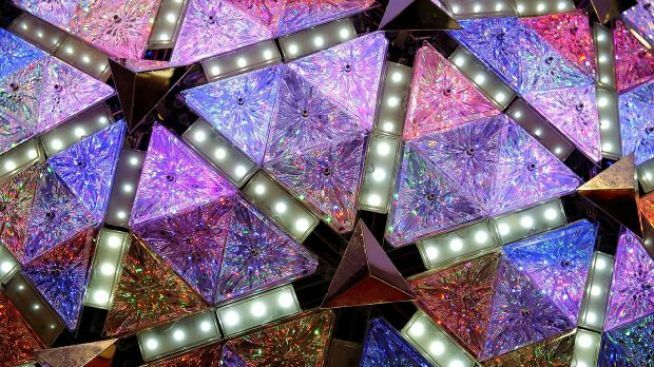 The New Year's Eve Ball, created to ring in 2009, is comprised of 672 crystal triangles and is themed "Let There Be Light." You've dressed to the nines, you've swilled bubbly at midnight, and now - as the first minutes of 2009 wash over you - is when you're getting your second NYE wind. Let everyone else scramble for those precious post-midnight taxis; what you need is an after-party. And if you're going to do it up right, you may as well join the hordes (and spend the last of your 2008 budget, or a chunk of 2009's) at one of the swankier clubs around town. Head over to event mavens joonbug.com for the staggering list of New Year's Eve parties at more than 50 venues, and check out the ones that'll be catering to the late-night set, such as Capitale, Home/Guest House, Cipriani, China Club, Room Service, and other high-tone joints who'll be doing the full open-bar-until-the-wee-hours thing (most end at 3AM, some later). And remember to drink water, or 2009's going to seem very loud and very bright.